One of those things that made it necessary to invent the word ‘iconic’, the splendid Raffles building is a gorgeous example of classical colonial architecture. 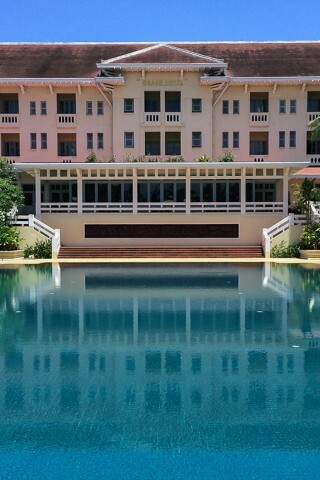 Built in 1929, it was Cambodia’s first luxury hotel and today has simply been made richer by time. Raffles in Cambodia stands for history, and the evidence is everywhere from the beautiful poster prints and photographs, right down to the minuscule, ornately embellished vintage elevator, an original feature and the first elevator in Cambodia. The cool, marble-floored lobby of Siem Reap’s premier historical hotel looks down on the magnificent 35-metre pool — the largest in Siem Reap. From here you could go for a dip, or slip into the Elephant Bar for a genteel G&T, or perhaps dive into the buffet in the Cafe d’Angkor (the best breakfast buffet in town, we think). The 131 rooms and suites are immaculate following a total refurbishment in 2012. Tastefully decorated with a pinch of Khmer influence, they’re traditionally furnished, with terrific beds and features that are classical down to the bone. The central building is the original and oozes charm while the new wings house the bulk of the hotel’s rooms, and are fresher but possess less of the characteristic colonial decor. As you’d expect, the gardens are equally magnificent, with plenty of open lawn, trees, plants and a produce garden, where they grow their own herbs and fruit and vegetables for use in the cooking classes. The pool is bordered by the villas, where Michelle Obama stayed during her visit in 2015. The service, as you’d expect, is faultless. If you can afford this, go for it — no other hotel in Siem Reap comes near the ambience and style here. At the back is the Apsara Terrace where they host cultural performances every Monday, Wednesday and Friday with a fantastic pan-Asian buffet. The quintessential high tea is available in the afternoons and comes with stacks of beautifully prepared sandwiches, cakes and free-pouring tea or coffee. Alternatively, the Happy Hour in the Elephant Bar means you can enjoy a little classical charm and luxury for effectively the same prices you’d pay in town. The boutiques here are testaments to worlds old and new with a mix of stunning contemporary silk-wear, richly embroidered carpets and beautiful crafts from across Cambodia. Walk-in prices are exorbitant, so be sure to check online. Check rates at Raffles Grand Hotel d'Angkor on Booking.com.